When it's up, ya gotta get down! Spent a couple hours on the river swinging some runs yesterday. High water is still the deal right now but fish are starting to show as they always do. Many will take advantage of these conditions and head right up the creek, though apparently the ladder is blocked again. They should get it clear shortly and those early fish will slide in safe at home in Lee's for the summer. Clarity and level made the decision rather easy to put on a tip and something big. The below photo was taken in the Confluence where Steamboat is running clear. Higher water and turbidity from the work at the dam put some color into the upper river and it could be like that on and off throughout the summer months. My fingers are crossed that they don't jack it up too bad. Texas Flood from SRV just seemed so appropriate with the almost winter levels we are still expeiencing on the river. It is dropping a little all the time but it may be a while before you can easily stroll out to your favorite rock. So until then, rock this! Some great,easy ties for steelhead. In this day and age where multi-station 40 minute flies are becoming the norm,this one ties up easy and will fish as well as any. Never forget that simple flies are still very effective. Don't over think it too much.These flies tied a little fuller will rock in the higher water that we are seeing right now. 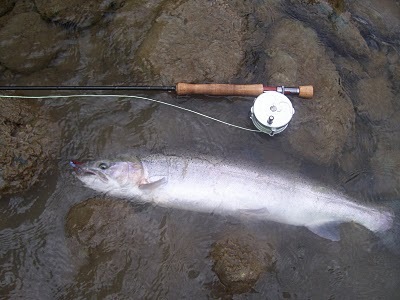 So, I am swinging through a favorite run on my favorite river and I feel the slightest tick on my line, I mean slight. Almost like a leaf hit it or something. "Did you feel that"? my buddy asks me. "I felt the tiniest,slightest tick" I tell him. "That was him man" he says. "He picked up the fly and was chowing on it for about 2 seconds." Amazing that a 10lb fish can go virtually undetected on the end of your line....it happens, often. Have you ever had that weird feeling on the end of your line that you couldn't put your finger on? So I have been thinking about this one a lot lately. How often do we have a fish eat our fly and swim with it chewing a bit on it and releasing it before we ever even know what happened. I know it happens way more than anyone might think. I have been watching fish on the North Umpqua do this very thing in various forms for 27 years.The nature of the river is such that these observations can be made often when fishing with a partner. Spotting a fish in a crystal clear pool and KNOWING you are fishing over a fish or two is unique and exciting.I have had the pleasure to watch those fish and their behavior as well as the behavior of those fishing for them. Watching your buddy work down to a spotted fish is always exciting. Watching to see if he feels what you see has been a huge education for me and how to refine my approach. Watching them swing different flies,colors and sizes through a run and watching the fishes reaction is just something that can't be done on the majority of steelhead rivers in the world. After many years of fishing these same runs we know each fishes lie and the general chances of getting him to eat. We classify runs as "long term parking"(generally deeper and slower) "short term parking"(shallower moving lies) "high rent"(the best spot in a run) "low rent" (the secondary and less optimum spots used when the high rent spots are taken) Knowing where these are and when to be in certain runs depending on fish movement, weather, water temps and levels is incredibly valuable to success on this the "finishing school" of steelhead waters. It takes a lot of hard work and dedication, but actually being able to put it all together and out think these fish is rewarding beyond measure. We can spot a fish and often tell by his behavior and where he is in the run weather he is an eater or not. For example,a fish that seems agitated and moving around a lot in his lie is one of those fish. The fish with ADD, he can't stop moving. These are often the aggressive fish that pretty much maul your fly when it gets anywhere in their wheelhouse.There are places where we spot fish and they are in the "taking spot". These are areas where for whatever reason the fish that hold in these lies EAT.There are many factors that determine why these fish do what they do. Lots of watching these behaviors over the years has built confidence in the ways to approach these fish. There are just some spots where you look down and see the fish in a certain spot and say to whoever you are with or to yourself "Ooooh,he's home and he's an eater" More often than not it works. So, the more you get to know your home river and where fish hold and why they hold there, when you feel that little subtle tick or tug, you will better know when to slam the door and hook and land the fish that to the uninformed and uneducated seemingly"wasn't there". "Hey man, did you feel that"?